If you have a cool project in mind, there is still plenty of time to enter the 1 kB Challenge! Deadline is January 5! I’m surprised it wasn’t linked somewhere above. Of course you couldn’t get as many features on that one due to fewer pins. I have made one using a PIC10F202 in march 2012.
value of resistor for each button. The 4 LEDS use only 2 output pins. Is a linear congruential generator better that a linear feedback shift register or how are they different? They are both PRNGs ( Pseudo Random Number Generator ) but are different in their implementation. wow that last link is a gem! I bookmarked that thanks [MINIMAN10000] . I often use LFSR in (V)HDL (like Verilog) because it’s very easy to implement in raw logic. Saw this project a few weeks ago. Impressive work and excellent documentation! He might want to move those resistors for the LEDs so they’ll act as protection for the uC. Right now if you hit a button while the LED is on you can fry that port. If you move the 180ohm resistors to be between the port and the switch+led you’ll get the same ability to light the LEDs but also protect the uC’s output port from being shorted to ground. The bridge connection of the buzzer requires higher input impedance than 42 ohm (probably noone manufactures them). Surprisingly, the maximal allowed output current would not be exceeded due to high output resistance, but too much power would be uselessly converted to heat. Not to mention there is no free GPIO. But in that case, if you hit the switch, the LED would have no current limitation. 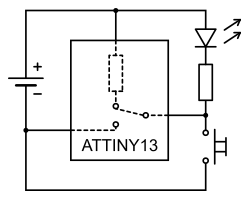 Best way would be to have two resistors – one in series with LED, another one in series with switch. Or in series with the pin, as you suggest. This is a little bit commented on the project page. When the GPIO goes from input to output, the internal pullup resistor is disabled first and the GPIO is always low. The button switch is parallel to (already open) lower output transistor, so it is not dangerous for the microcontroller. This is also used to prolong short button presses during the game (so the LED is on for at least 150 ms each time the button is pressed).